These sweet potato sandwich rolls are a snap to fix using a mixer with a dough hook. Or, add all of the bread ingredients into the bread machine pan, set it on the dough cycle, and let the machine do the work. If you use a bread machine, all you have to do is shape the rolls, let them rise one more time, and then bake. The mashed sweet potato gives the rolls character, along with texture and bright color. Split them and toast or grill them for burgers, or add your favorite sandwich filling. Leftover turkey, chicken, and ham go well with the sweet potato flavor, and the rolls make delicious sandwiches with deli meats, cheese, and sliced vegetables. Peel the sweet potato and cut it into chunks. Place it in a saucepan and cover with water. Bring the water to a boil over high heat; reduce the heat to medium-low, cover the pan, and continue to cook until the sweet potato is tender. Drain the potato chunks thoroughly and then mash them until smooth. Measure 3/4 cup and set it aside to cool. In a large mixing bowl, combine 2 1/2 cups of the flour with the yeast, sugar, and salt. In a separate bowl, whisk the milk with the whole egg, softened butter, and cooled sweet potatoes. Add the sweet potato mixture to the dry ingredients and mix until moistened. Attach the dough hook and continue kneading the dough for 8 minutes, adding more of the remaining 1/2 cup of flour, as needed. The dough will be somewhat sticky. Shape the dough into a ball and place it in a large buttered bowl. Turn the dough to coat thoroughly with the butter. Cover the bowl tightly with plastic wrap and let the dough rise for about 1 hour—or until doubled—in a draft-free place. Remove the dough to a floured board. The dough will weigh about 27 ounces. Cut the dough into 9 (3-ounce) portions. Shape the dough pieces into balls. Take a ball of dough and roll it into a 12-inch rope on the work surface. With the rope, make an overhand knot (also known as a "single knot" or "granny knot"), leaving some space in the center of the knot and two long ends. Loop one end around the circle the knot made (once or twice, depending on the length of the ends). Repeat with the other end. Place the roll on the prepared baking sheet. Repeat shaping knots with the remaining dough balls. Cover the rolls loosely with kitchen towels and let them rise in a draft-free place for 30 minutes. In a small bowl or cup, whisk the egg white with the water. Lightly brush the egg wash mixture over the rolls and then sprinkle with sesame seeds or poppy seeds, if desired. Place the rolls in the oven and bake for 16 to 18 minutes, or until golden brown. Active dry yeast and instant yeast are interchangeable in recipes. However, the active dry yeast must be rehydrated in liquid. If you are substituting, use the same amount of active dry yeast. Instead of adding the yeast to the dry ingredients, heat the 1/2 cup of milk to about 110 F and add the yeast. Let it stand for about 10 minutes. Whisk the milk and yeast mixture with the egg, butter, and sweet potato and add to the dry ingredients. Continue with the recipe. 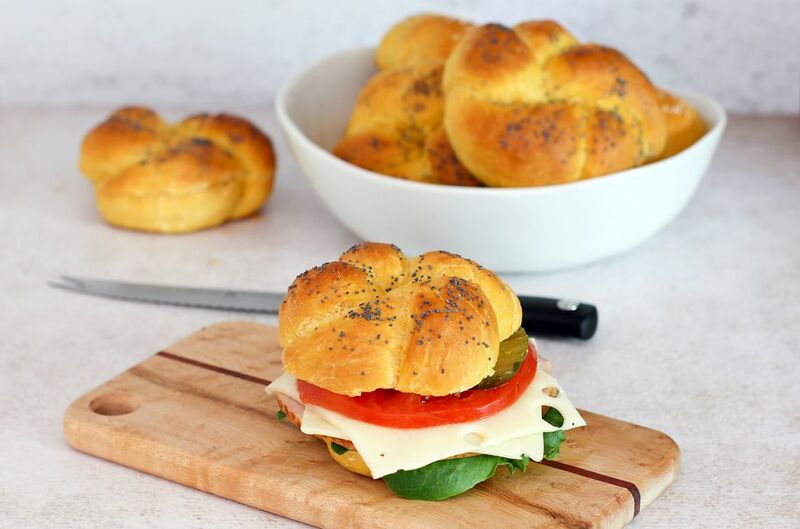 A Kaiser roll stamp is another way to give the rolls their classic shape. Flatten the balls of dough into rounds about 4 inches in diameter. Press the Kaiser roll stamp into the dough, stopping just short of cutting through. Arrange the rolls, stamped side down, on the prepared baking sheet. After the 30 minute rising time, flip the rolls over, so the stamped side is up. Re-stamp the rolls, carefully following the lines made with the first stamping. Brush with the egg wash, sprinkle with seeds, if desired, and bake as directed.